Dogs rely heavily on body language to communicate with other dogs as well as to people. Understanding what your dog's body language signals means can help you learn more about your dog's mental and physical needs. A dog on their back can indicate different behaviors depending on the context. If you see a dog roll on their back and wiggle or kick their legs, and their overall body language looks loose and relaxed, this is a dog that is feeling happy and playful. You may also see dogs do this when they are playing with each other. Rolling onto the back is a natural play behavior that actually helps a dog to avoid playful bites from the other dog or dogs, while getting in some of their own. Some dogs also roll on their backs to scratch and itch on their back or to enjoy the surface they're rubbing on, such as fresh grass or if you see a dog rolling on a bed. This is a normal behavior but if you notice your dog doing this a lot and flaky, irritated skin, bring your dog to a veterinarian to see if they have a skin allergy or other condition. On the other hand, if you greet a dog and they immediately roll on their back, or do this when greeting another dog, this is a dog that is nervous or fearful. It may also simply indicate a dog that is showing this posture to a new dog to indicate, "hey, I'm not a threat!" to diffuse any possible tension. A fearful dog may also release some urine in this posture. 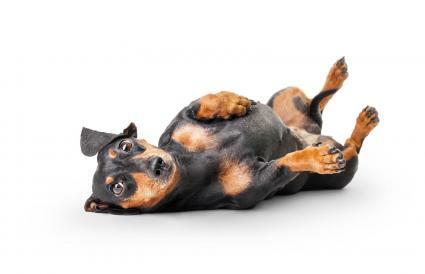 Some fearful dogs may growl after rolling onto their back when you begin to approach them. In this case the dog has rolled over to diffuse a possible conflict and growls when the person he is anxious about ignores his signal and keeps moving closer. This posture is often described as a dog "showing submission." It's more useful to think of it in terms of the dog's emotional state and what he's hoping to accomplish with the behavior. If you see a dog laying on their back and napping, this means your dog feels safe and relaxed in his environment. A dog willing to sleep with his belly up feels confident and secure. Note that this doesn't mean if you see a dog sleeping in different positions that they are not relaxed, because dogs are just like people and everyone enjoys different sleeping styles. The play bow is a body language signal used to solicit play from other dogs or even people and other types of pets. A dog will do this to get another animal to play, or you might see them doing it toward an object which can indicate excitement. Play bows are usually accompanied by other excitable behaviors such as circling, barking and growling. Stretching looks very similar to a play bow, but it's not accompanied by excited, "bouncy" body language. A dog will stretch at certain times, such as first thing in the morning. Dogs will also stretch when "greeting" someone they are comfortable with. Most dogs will also do a stretch in two ways for a full body stretch. One way will be in the bowing, or "downward dog" position. The other stretch involves leaning all the way forward and stretching out the back legs. Some dogs love prancing around the house or yard with a toy in their mouth. This behavior generally indicates play and happiness. Retrievers have a strong instinct to carry items in their mouths although plenty of other breeds will do this. A dog will do this more often if they've been trained to carry toys in their mouths. Dogs will prance around with their toys to initiate play by getting other dogs (or people) to chase them to get the prize. If your dog begins yawning, it could just mean that he's sleepy and needs a nap. But yawning can also be a sign that your dog is stressed. If your dog yawns and then curls up and goes to sleep, then he's probably fine. But if you notice him yawning during a stressful situation and it's accompanied by other stress signals such as lip licking, drooling, shaking, whining or turning away, this means your dog is anxious. Dogs that are nervous will lick their lips or do what is known as a "tongue flick" where the tongue seems to flip up and touch or even cover their nose. Lip licking will usually happen in concert with other stress body language signals such as yawning and turning away. This is a subtle body signal that humans often miss. If you notice your dog turning his head to look away from something bothering him, this means he's stressed. Dogs will do this when greeting other dogs that they may not feel comfortable with. It can be observed in other situations such as a dog being in a room where people are yelling. You will usually see the dog do other stress signals at the same time such as lip licking. If the dog appears stiff and "frozen in place" this can indicate they are either terrified or getting into an aggressive posture. Some dogs will freeze in place if they are "hunting" and are getting ready to pounce and chase their prey, such as dog focusing on a squirrel in a tree. Other dogs will freeze in place if they are so scared, they don't know what to do. You can tell the difference from the context of the behavior and other body language signals. If the dog's posture is low to the ground, with their tail between their legs and ears back, and there's something clearly upsetting to them in the environment, your dog is likely frightened. If the dog's posture is tight and "forward-focused" with their eyes fixated on a prey object like a bunny or squirrel, your dog is getting ready to go after the prey. If the dog's body posture is stiff but their ears are forward, lips are pushed to the front of the mouth and you hear growling, this is a dog that is an aggressive, warning posture. Sniffing is a natural behavior but can also be what's known as a "calming signal." 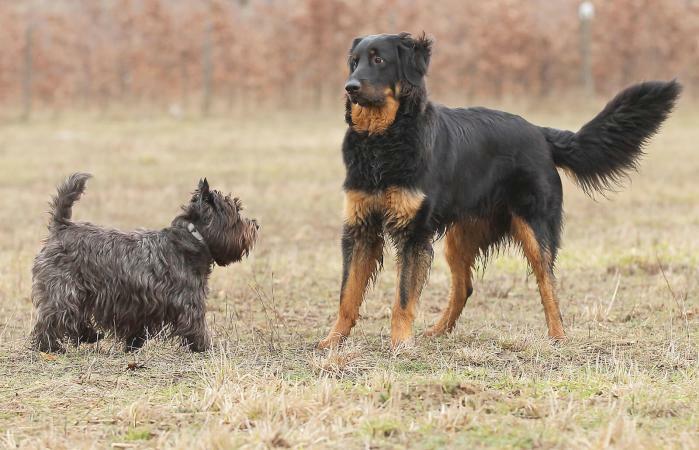 You may notice this behavior when your dog meets new dogs or is in an area that he's not familiar with and is nervous. It may not indicate anything more than your dog is sniffing the ground to learn about the place he's in or the dogs he's meeting, but if you see this behavior accompanied by other nervous signals, this means your dog may feel on edge. A dog with his tail tucked down is showing fear. Depending on the breed and physical makeup of the dog, the tail may either point straight down, tuck somewhat under his hind legs or even point underneath his body almost parallel to it. You may also see trembling and the dog's body crouching lower to the ground as if the dog is trying to make himself look "small." It's important to understand that just because dogs use body language signals to communicate, they will not necessarily interpret humans mimicking these signals in the same way. The best thing to do when you see your dog communicating with body language is to understand the dog's overall intent. If your dog is showing any signals that he is happy, such as the play bow or rolling over and wriggling, it's safe to assume your dog wants to play and get attention from you. You can reciprocate by joining him in a play session or enjoying some cuddles. If your dog is trying to tell you that he's afraid, respect his wishes and don't push him to do or experience anything he's scared of. He may simply need some time and space to relax around the scary object, animal or person. 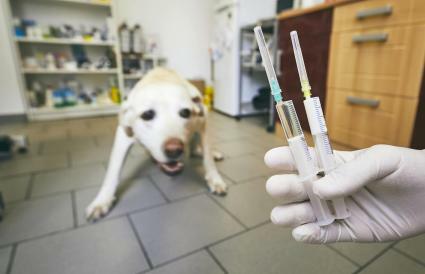 In cases of intense fear, consult with a qualified behavior professional who can help you develop a behavior modification plan to work with your dog's fears. A dog that is using aggressive body language, either in an offensive or defensive posture, is letting you know that he's uncomfortable and pushing him further could lead to a bite. In these cases, it's best to remove your dog quietly from whatever is stressing him and do not chastise him. In the past dog owners were advised to punish a dog for growling but this is counterproductive. Telling a dog it's bad for them to communicate that they are uneasy diminishes the dog's trust in you and the next time he's uncomfortable, he may move on to biting if growling is not an option for him anymore. If your dog is becoming defensive over something that is stressful to him, discuss this with your veterinarian or a behavior consultant to determine how to acclimate him to his fears. If our dog is showing offensive aggression, such as guarding an object from you, you should work with a professional right away to help you understand this behavior and work on a plan for managing and modifying it. Some dogs may instinctually display an offensive posture to strangers, particularly dogs bred for guarding. Dogs with these tendencies should be properly socialized and have obedience training. If you feel uncomfortable with the level of aggression they display to strangers, talk to a behavior professional for advice on managing this behavior. The way dogs communicate with each other is endlessly fascinating and research continues to find new, more complex interpretations of their behavior. The more you know about what your dog is trying to say, whether it's to you or to another animal, the better you'll be able to ensure your dog is comfortable and minimize stressful encounters.